Neville Jetta and Sam Frost have formed part of the AFL's No.1 defence. JOSH Kennedy and Jack Darling be warned. Flying west for Saturday's preliminary final is the AFL's No.1 defence. Three months ago the key question surrounding Melbourne was whether they could win the premiership without Jake Lever. Over the past 10 weeks it has been answered with exclamation points. Since the Demons' shock Round 15 loss to St Kilda they are leaking just 69 points per game. Under coach Simon Goodwin the Demons are 18-0 when they concede fewer than 75 points. Richmond coach Damien Hardwick says the Tigers are a defence-orientated side but even the Tigers are a shade behind. Goodwin decided to hand a few players the chance to audition for Lever's post. After Joel Smith and Harrison Petty had their cracks, Sam Frost received his opportunity in Round 16 and hasn't looked back. He is the man to stop Kennedy at Perth Stadium with Oscar McDonald set for Darling and Neville Jetta the ideal match-up for Eagles livewires Willie Rioli and Liam Ryan. 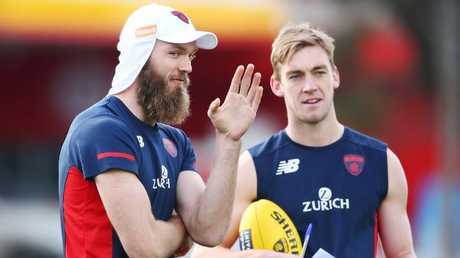 Ruckman Max Gawn will likely drift back to take a couple of intercept marks in another ingredient which has added to this backline mix. Since Round 15 only one team has kicked 100 points against the Demons. That was Geelong in Round 18 and it required Zach Tuohy's kick after the final siren to cap a masterful display of goalkicking - 16.4. Fancy that, the only time the Dees have leaked 100 points came as they conceded just 20 scoring shots. Perhaps a pay rise is in order for defensive coach Troy Chaplin. Every element of the Demon defence has lifted since Round 15. Ask Hardwick about offence and he will point out that the bulk of scores in the AFL come from creating turnovers. Well, Melbourne is giving up 16 fewer points off turnovers since Round 15, sliding from 51 points to just 35. After Lever went down the Demons internally turned to the West Coast side of 2015 for inspiration. The Eagles lost key pillars Eric Mackenzie and Mitch Brown to ACLs by the end of Round 1 and yet rebounded to reach the Grand Final. "We were initially a bit rocked by who was going to fill those positions," former Eagle Xavier Ellis said in June. "But it actually gave us an extra layer of protection in that no one expected it to work. "Lever is a great footballer, but who's to say the next option isn't a player or a game style that's better than the one that had Lever involved anyway? "At Melbourne, what's to say the next guy isn't equally as good as Lever (but) just hasn't had the opportunity at reading the play and having a licence to try and mark everything and create rebound."